The U.S. ship whose crew overcame a band of pirates off the coast of Somalia docked in the Kenyan port city of Mombasa on Saturday, its sailors relieved to be safe but distraught over the fate of their captain, who remains captive in a lifeboat at sea. 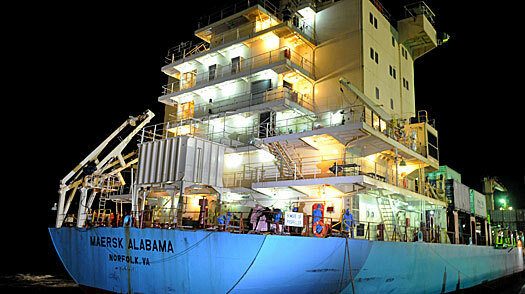 Soon after tugboats pushed the Maersk Alabama into port, crew members appeared at the stern of the ship to praise Capt. Richard Phillips. “He saved our lives!” said one man, identified by The Associated Press as second mate Ken Quinn, of Bradenton, Florida. “He’s a hero.” Another, who identified himself as ATM Reza, said that he had persuaded one pirate to go to the engine room, where he overpowered the pirate, stabbing him in the hand and tying him up. As the Alabama was coming to port in Kenya, pirates off Somalia hijacked yet another ship, a tugboat flying under an Italian flag. Sixteen crew were aboard, and ten were Italians. With the crew of the Alabama safe, their thoughts remained with Phillips, who is still being held captive in a lifeboat off the coast of Somalia. In circumstances that are still unclear, he got into the lifeboat with the pirates after the crew retook control of the ship from them. “These guys have been through a hell of a situation, and their boss is still floating in the middle of the ocean,” said Mark Zimmer, the public diplomacy officer of the U.S. embassy in Kenya for Somalia. It is not known when the crew will return home, but some officials say they may remain on the Alabama for at least another day as they are debriefed by the FBI and U.S. military officials. The pirates, floating with their captive in a lifeboat surrounded by U.S. warships, have not demanded a ransom for Phillips. Numerous shipping companies have paid millions of dollars in ransom to free some of the dozens of ships that have been hijacked in recent months off Somalia. A Somali man who said he was a go-between for Somali pirate leaders and the men who captured the Alabama told TIME that the pirates are not sure what to do with Phillips. Somali elders were trying to negotiate his release with the U.S. Navy, but by Saturday evening there was no apparent progress.